When They Removed The 1940’s Blip, Did They Put The Ice Back? 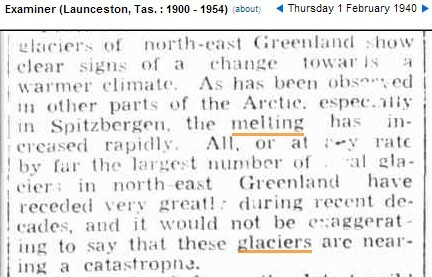 The hockey team recently “removed the 1940’s temperature blip.” Hopefully they remembered to put all the ice back in Greenland, when they did their taxpayer funded history rewrite. by far the largest number of glaciers in north-east Greenland have receded very greatly during recent decades, and it would not be exaggerating to say that these glaciers are nearing a catastrophe. 3 Responses to When They Removed The 1940’s Blip, Did They Put The Ice Back? That would explain all of those damn fluvial traps at The Greenland Country Club. Shock News: Antarctic Continent attacked by Mosses and Lichens!!! The problem is that all the photos are from islands off Argentina. In any case, the only invasive species in Antarctica over the past 30 years has been activist climate “scientists” and we all know what damage they have do.